I have an inexplicable love of stickers. If I’m truthful, the love stems more for the attention that the sticker garnishes, than the glue laden paper itself. Letting people know that “I Voted!” or “I Support So-and-So!” has always given me a small relish of pride. It’s easier to wear something that whispers for attention, than to actually go around shouting for people to look at me. That’s why I was dissapointed last Tuesday night to see everyone around me wearing bright red “Yes! 296” stickers. I was of course also there at City Council to show my support for 296, but no one let me know ahead of time about the accessories. The stickers referred to 2012-296, the proposed addition to the human rights bill that would include sexual identity and orientation as classifications that business owners and housing managers are forbidden to prejudice against. Currently, it is illegal for an employer in Jacksonville to fire someone based on their race, color, religion, political affiliation, gender, national origin, disability, age or marital status. Unfortunately, that means it is currently legal for a company to decide to fire someone for being gay. Or for a landlord to kick out two tenants who he thinks are engaging in homosexual activity. 2012-296 has nothing to do with gay marriage. It does not seek to overturn any current laws or ordinances. The only thing it seeks to do is prevent gay, lesbian, bisexual, and transgender residents of Jacksonville from being prejudiced in their places of work, or homes. That, and it hopes to make Jacksonville a safe and attractive place for other GLBT people to re-locate to. Perhaps that last part is why, in addition to the countless pleadings for the passing of 2012-296, there were also emotionally charged warnings, of why this bill should be stopped at all costs. The very first gentlemen to come forward and speak walked to the podium proudly gripping his notes. Wearing his Sunday finest, including a bright bow-tie, he wasted no time at the microphone, urging the council that this bill was going to hurt Jacksonville. Barely breathing in between reading his cards, he made sure to tell all that he opposes this as a Christian, and doesn’t want Jacksonville to become “like California, a gay Mecca.” He seemed unhappy to be cut off by the Council, as he went over his allotted three minutes of speaking time. From the overflow room where my husband and I were sitting, watching the projector screens with 50-60 other late comers, there were groans and sighs, but I was surprised to see that no one seemed taken back at all. My face was the one most agitated. Of course, it occurred to me. Almost everyone here is used to being talked to like this. My own privilege, of being straight, and therefore immune to this type of out-in-the-open discrimination, gave me pause. I have no idea what it’s like to be gay in Jacksonville. Thankfully, the large majority of speakers, young, old, gay, (and at least I think) straight, were in support of the proposed change. Over and over my eyes welled up with tears, listening with bated breath to the brave and incredibly intelligent Jacksonville residents who made emotional, logical, and clear cut reasons for why this ordinance should pass. For the first time in a long time, I was proud of my city. At the same time, there were moments of incredible frustration and shame, like during the testimony of the middle aged white pastor, who, clutching his signed protest letter from more than a dozen other Jacksonville religious leaders, barely hid his anger that Jacksonville would even consider passing a law like this. I had to clench my fists, as cliched as that sounds, to suppress the urge to run up to him and shout “How can you use Christ as a reason to discriminate!? !” Thankfully, just like everyone before and after him, his three minutes were eventually up. Person after person stood up before the City Council, in a seemingly endless line. By 8:30, Ryan and I had to leave to let our dog out, but we watched from home until after midnight. It was exciting and thrilling to see so many people in Jacksonville stand up and be active in their local government. For me, the most encouraging part was seeing the sheer number of people who were standing up for what was right. Because we got there late, and put our names down well after the stack of “speaking cards” was high, neither of us got the chance to speak before the City Council. This is probably a good thing. If I had been standing in front of representative Kimberly Daniels, who I had witnessed, with my own eyes and ears, ask a man why, “These protections wouldn’t eventually lead to people whose sexual orientation includes animals, or dead people” I probably would have lost it. Screamed at her for being so ignorant, hateful, and, yes, stupid. It is downright stupid to think that changing a city ordinance to include protections for people to not getting fired over being gay, means that we all have free reign to screw our dogs. Actually, I think she used the example of a farmer and his horse, but that’s besides the point. The point of course, that stood out to me, was how amazing, and incredible the people of my city are. For standing in line for over an hour just to get a chance to ask for the rights that are undeniably already theirs. 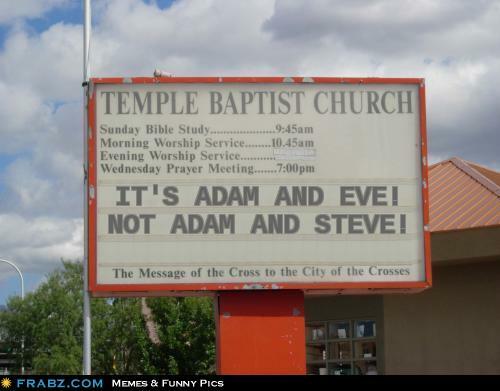 For listening, I’m sure not for the first time, to scared small minded individuals remind everyone that God created “Adam and Eve, not Adam and Steve”, yet somehow still remain calm. As I sat there next to my husband, who I am so grateful I was able to marry, I silently thanked God that he did create Adam, Eve, and the too often lamented gay neighbor Steve. Because together, the three of us make one hell of a city. Have you read this? It’s among the most powerful witnesses I’ve seen. Perhaps food for thought…?